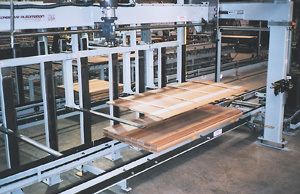 Automated Lumber Feeder Stacker Material Handling Machinery from Creative Automation – Creative Automation, Inc.
Lumber feeding and stacking systems are examples of solutions that Creative Automation has engineered for the building/housing industry. 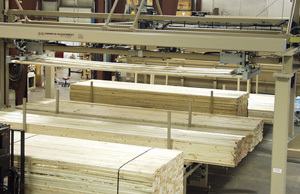 Feeder picks up lumber one layer at a time from multiple loads of different sizes. 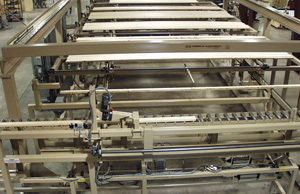 Multiple singulating conveyors each contain a different size of lumber. Individual pieces are fed in the correct order based on the run list. Fork stacker setting down a layer. 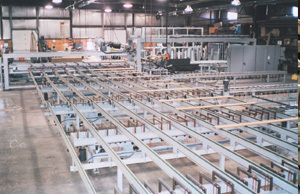 Collating and tracking of lumber from multiple production lines prior to stacking.